Because I am a member of the Carmex Blog Squad, I am informed of and privileged to bring you reviews of Carmex's newest products! This is something that I have been doing for awhile and have really grown to love the Carmex brand. The newest products that have been introduced by Carmex are lovely and will definitely impress you as they have me. Because I am a mom, I wash my hands frequently. After diaper changes, before cleaning wounds, bathroom breaks, preparing food...all this requires clean hands. Because I usually apply lotion while I am moving and going from one thing to the next, I do not like a greasy lotion. I HATE applying a cream and having to "dry" my hands for the next half hour. What a perfectly good waste of time that is. So, I was wondering what Carmex would offer me in way of fast and quickly absorbing lotion. Carmex® lip balm was invented in 1937 by Alfred Woelbing, literally on the family stovetop. For the next 20 years, Alfred and his wife made Carmex by hand and poured it into the familiar yellow-capped jars. Carma Labs employs about 100 people and is still owned and operated by the family: Alfred's grandsons Erik and Paul Woelbing. The Woelbing stove is now used for cooking things the family can actually eat. One thing that really sets the Carmex brand apart from the others is the packaging. I love how the lip balms come in small tins...they fit in anyone's pocket, purse or backpack and are sooo super convenient. Also, the Carmex brand is easily recognizable due to its yellow container color...I always know Carmex when I see it! So, for this review I was sent a lovely package of Carmex Healing Lotion and Cream to try. 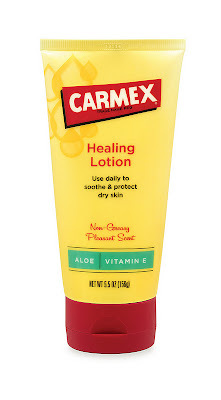 The first product that I tried was the Carmex Healing Lotion. This stuff is amazing. It has a light scent that smells like shea butter (to me) and goes on very evenly and smoothly. I was really curious to see if it would be greasy or not and to my delight, it was not at all! Within seconds of applying it I was able to type on my laptop with no greasy residue on my keys. The Carmex Healing Lotion features soothing aloe and vitamin e and is formulated to heal your skin on a daily basis and also to moisturize. The Carmex Healing Cream is a thicker formula that helps to heal severely dry, cracked and irritated skin. There are 9 concentrated healing and moisturizing ingredients that work together to help soften especially dry areas of the skin. The suggested price for both of these fabulous Carmex products is $5.99 in the 4 ounce tube. So, in my opinion, these new creams and lotions from Carmex are fantastic. I can use both of them regularly without worry of greasiness and gunk on my hands. I love the price as you really get alot of product for your money. The smaller tubes are perfect for sticking in my purse and having them readily available for on the go...which is just what this busy mom needs!! Visit Carmex and then come back here and tell me which product you would love to try. :) You do not have to be a blogger to enter, but you must have a valid email where you can be reached should you win. If you do not leave an email address, it must be where I can easily find it. This giveaway is open to US residents and will end 11/28 at 11:59 pm EST. The winner will be chosen using random.org and will be notified by email. The winner will have 48 hours to respond, or another winner will be selected. 1. "Like" Carmex on Facebook. 2 entries, so 2 comments. 2. Follow Carmex on Twitter. 2 entries, so 2 comments. Disclaimer: I received no monetary compensation for this post. As a member of the Carmex Blog Squad I did receive Carmex products for review purposes. All quotes and stock photos are from the Carmex website and email. Prize is being provided and shipped by the sponsor. All thoughts and opinions are 100% mine. Thank you so much for sharing this review with your readers and hosting a giveaway. We are so glad to know you liked the products. Good luck to everyone who enters to win the giveaway! I would love to try the CARMEX LIME TWIST STICK. I'd like to try Carmex's Healing Cream to counter my persistent dry hands. I would like to try the Moisture Plus Lip Balm. i want to try the lip balm! I would like to try the healing lotion. I would like to try the lime lip balm. I'd like to try the Moisture Plus Sheer Berry. I would love to try the CARMEX VANILLA STICK. I follow Carmex on twitter(terri142). I follow My Opinion with GFC. I'd like to try the lime twist chapstick. I'd most like to try the Healing Cream because I have super dry skin.